Iraq will not accept any security deal with the US which does not include a date for the pullout of foreign troops, a senior Iraqi official has said. 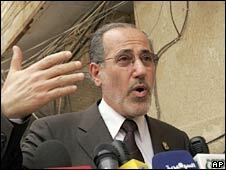 National Security Adviser Mowaffaq al-Rubaie was speaking in Najaf. The prospect of setting such a timetable was raised by Iraqi Prime Minister Nouri Maliki on Monday. The US state department said any pullout would be "conditions-based". The UN mandate allowing a US presence in Iraq will expire by the end of 2008. "We will not accept any memorandum of understanding if it does not give a specific date for a complete withdrawal of foreign troops," Mr al-Rubaie told reporters in Iraq's holy city of Najaf. "Our stance in the negotiations under way with the American side will be strong," he said, but added that it was proving "very difficult" to set a pullout date. Mr al-Rubaie was speaking after meeting Iraq's top Shia cleric Grand Ayatollah Ali al-Sistani. In Washington, US state department spokesman Gonzalo Gallegos said the US and Iraq were in agreement over the principle of a US withdrawal. "However, that decision will be conditions-based. We're looking at conditions, not calendars here," Mr Gallegos said. He said the US was "making progress" and was committed to departing, pointing out as evidence that the US has transferred over half of Iraq's provinces to provisional Iraqi control. However, Mr Gallegos refused to divulge details of the any progress towards an agreement. The US and Iraqi governments have been negotiating a detailed bilateral Status of Forces Agreement (SOFA) since March and it was supposed to be concluded this month. On Tuesday, a US state department spokesman said Washington would not divulge details of the talks. Many Iraqis want to see an end to the American military presence in their country, but are fearful of the consequences for security, correspondents say. The US position has always been that setting a timetable for withdrawal gives an advantage to insurgents who have been battling US-led forces since the 2003 invasion which overthrew Saddam Hussein. A possible withdrawal from Iraq has become a major issue in the US presidential election campaign and could also figure prominently in local elections in Iraq in October.